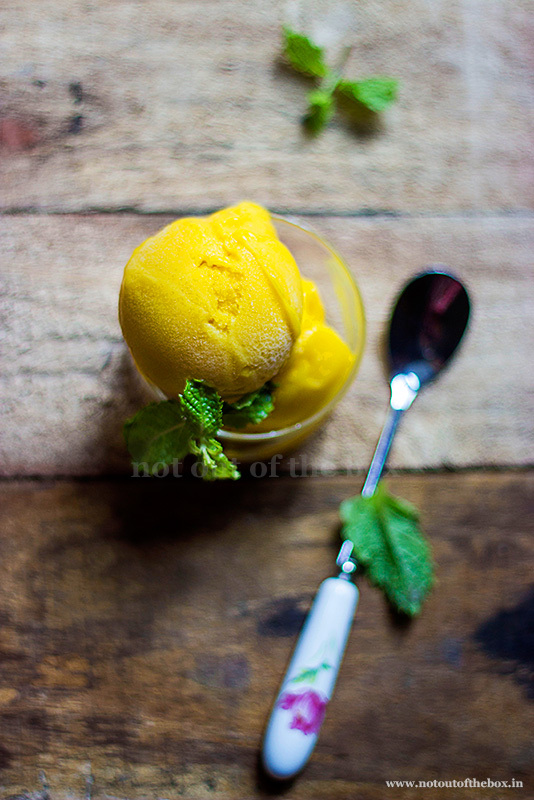 I made this Mango Sorbet recently with just a few staple ingredients. The process was easy, and I got a smooth, light sorbet which we enjoyed a lot. Add sugar and water in a saucepan, make a simple syrup by stirring the mixture over medium heat until the sugar granules melt completely. Peel and cut the mangoes into cubes. Blitz in a food processor until smooth puree forms, keep aside. We’ll be needing 2 cups of Mango Puree to make this sorbet if you’re having excess puree you can always freeze that for later use. Now in a bowl add mango pulp, simple syrup, and lemon juice. Whisk well until everything mixed uniformly. Alternately you can do this in your food processor too. If you’re using an ice cream maker, then transfer the mango mixture to an airtight container. Chill in the refrigerator for 3-4 hours, preferably overnight. On the next day churn mango mixture in your ice cream maker according to the maker’s instructions. You’ll get a soft-serve consistency after 20 minutes of churning. You can have this immediately, for a more firm version freeze the sorbet in a container for 3-4 hours. If you’re not using an ice cream maker, then pour the mango mixture in an aluminium container (cake tins work best). Freeze for 2 hours, then take out the pan from freezer, stir vigorously with a fork. Return the pan to the freezer again and do this fork stirring after every 1 hour for at least 4-5 times or until you get the desired soft serve thickness. Keep the pan covered in the freezer for next 3-4 hours. 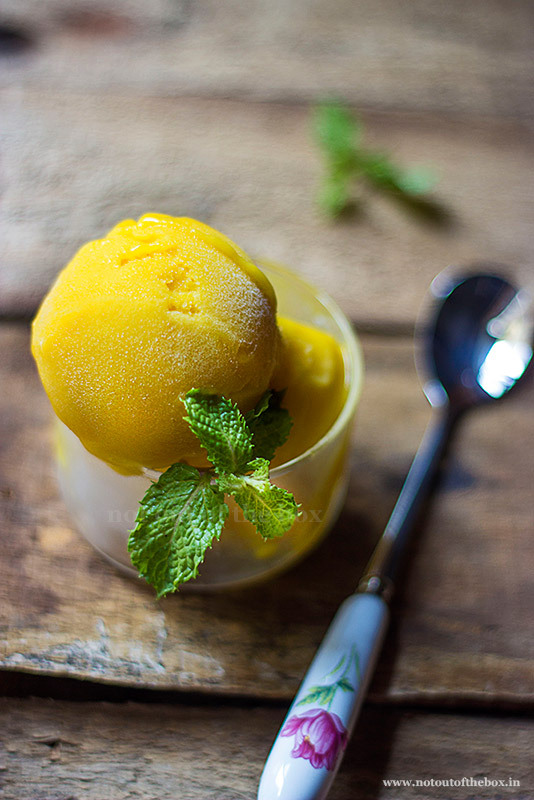 Scoop out and serve refreshing Mango Sorbet with some honey drizzled on top. Pair it with your favourite cake slice or enjoy on its own. If the Mango Sorbet becomes too much hard to scoop out, let it sit for 10 minutes at room temperature, then serve.